Composite ceramic lining provides maximum combustion efficiency and most fuel efficient crematory in its class. Hearth floor constructed with pre-fired replaceable tiles. 20″ load height compatible with a â€œchurch benchâ€. No additional elevating equipment required to load a case into the crematory. Redundant afterburner system to insure air quality standards are met during the cremation process. Functional control panel designed to simplify the cremation process, shutting off the unit upon completion of the cycle. 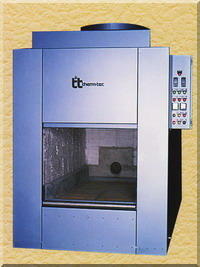 Human Crematory from ThermTec, Inc. The Therm-Tec model SQC-300 human crematory system is pre-wired, pre-piped and pre-tested before shipment. Installation of cremation system amounts to off-loading the crematory, setting three stack sections, and connecting gas and electric to a single point connection on the crematory.